As an Artist Raul has been influenced by all the Cultures that he has traveled to and beyond. “I consider my Travels through this Planet as some of my most valuable “Education”- Real Life Experience, getting a deeper taste of other cultural values and adopting some to one self. From Egypt, Israel, Jordan to Bali in Indonesia, Europe and Latin America, through more than 20 Countries, Raul has allowed this Planet to affect him so that he can affect it back. He has particularly been most influenced and inspired by the Surrealist Movement with artist such as Salvador Dali, Rene Magritte and others like Hieronymus Bosch, Ernst Haeckel, Diego Velasquez, Manet, Frida Kahlo & Diego Rivera, Jose Clemente Orozco, David Alfaro Siqueiros, as well as “The Symbolist” : Auguste Rodin, Alphonse Mucha, Gustav Klimt, William Blake & Jean Delville. 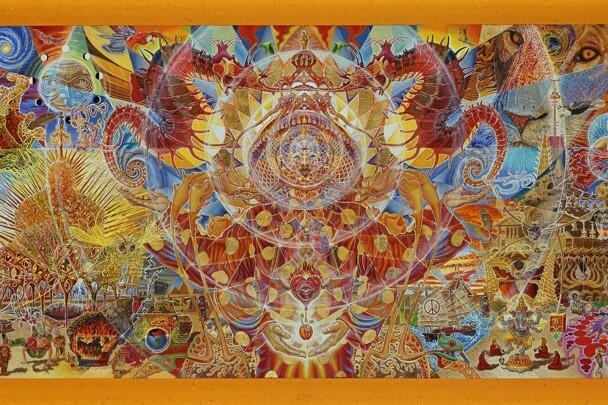 Most recently he has been attracted and inspired by the current “Visionary Art Movement” aka “Interdimensional” and “Fantastic Realism”, introduced to him by fellow artist Luke Brown.